Rejoice pizza lovers who recently switched to a vegan diet! The painful choice between healthy plant-based cooking and sinful deliciousness is resolved! And I’m not even talking about stepping away from the wholesomeness of fresh ingredients towards highly processed stuff – for this pizza, we’re even making the dough ourselves! Vegan pizza oftentimes can turn into a high-maintenance disaster. Even if it tastes okay, it might still call for too many processed or store-bought ingredients that can contain too much sodium or traces of dairy/eggs. If you never liked vegetables on your pizza before you turned vegan, you might be in for a disappointment: vegan pepperoni can be just as bad for you as the non-vegan stuff, and vegan cheese pizza… well, it just defies the whole purpose of going vegan! – Load it up with veggies! For this recipe, I grilled eggplant and zuccini to make the pizza more filling, and then topped it with an array of fresh vegetables – this way they come out crispier and less processed overall after baking the pie. – Cheese or no cheese? 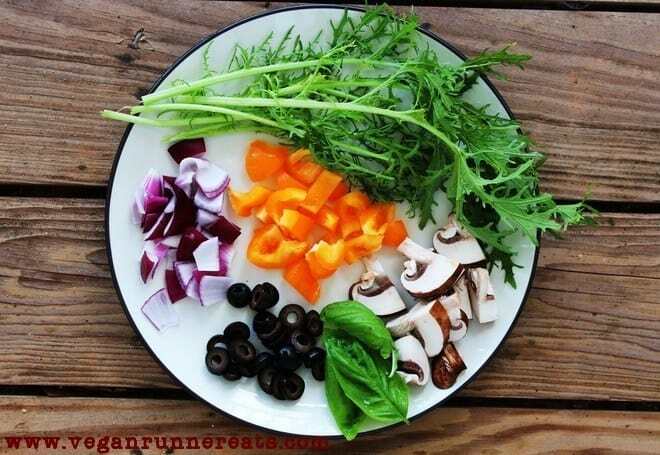 While a lot of vegans are accustomed to the taste of cheeseless pizza, most of us still have a long way getting there. You can find a number of homemade cheese substitutes online, or opt for a store-bought variety. We don’t have a large choice of vegan cheeses in Southern Alabama (surprise! ), but I’ve tried Daiya mozzarella shreds and another mozzarella substitute on my pizza, and both worked well. My only advice: stay away from vegan cheeses that have a long list of hard-to-pronounce ingredients! Making this pizza can turn into an all-day affair, but it doesn’t have to! Planning ahead will help you save time. For this purpose, I recommend that you make the dough in the morning and forget about it until you’re ready to proceed with the rest. If making your own marinara sauce, do it the day before – or use a store-bought version as suggested above. Prepare vegetables in advance (about an hour before you assemble the pizza). Grill eggplant and zucchini at the same time as you’re getting the crust ready. Start preheating the oven with the pizza stone inside well in advance to let the stone get very hot. A pizza stone is a great addition to any kitchen: since most of us are unlikely to splurge on a specialized pizza oven in our houses, using a pizza stone brings us at least one step closer to a better pizza crust. Ever had those soggy homemade pizza crust disasters? A stone eliminates that. Plus, some brands are very cheap, and still do a good job! Also, you can bake cookies on a pizza stone later. The only advice: when washing the stone after use, do not use dish detergent! The material of most stones is very porous, and using soap can make your future baked goods taste funny. For vegetable toppings, I first grilled some eggplant and zucchini (if you put them fresh on a pizza, they won’t have enough time in the oven to cook through), and then chopped up a number of other vegetables – mushrooms, black olives, red onions, yellow bell peppers, but you can use whatever combo you like. These went on the pizza on top of eggplant and zucchini, and then were topped with vegan mozzarella. My pizza spent about 10 min in the oven at 450°F until the crust was firm and browned. After I took it out of the oven, I topped half of the pizza surface with some torn-up spicy kale and fresh basil (my husband didn’t want any of those). The crust cooks a little more on top of the pizza stone if you don’t take the pizza off of it. 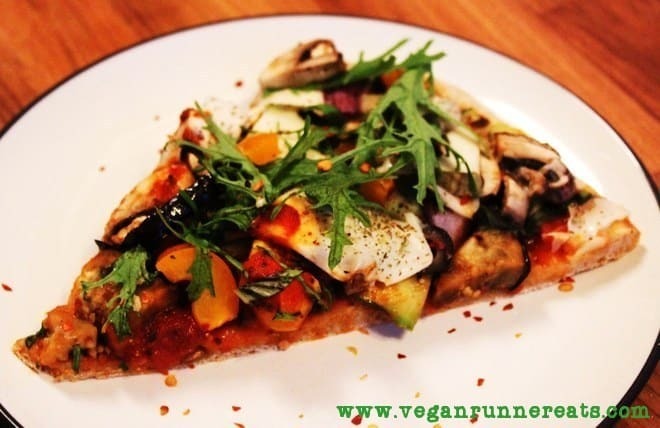 Regular pizza with vegetables gets a vegan makeover in this recipe! Grilled eggplant and zucchini make this pizza filling, and a medley of fresh vegetables adds a nice crunch. Use store-bought vegan mozzarella, experiment with homemade cheese substitutes, or go completely cheese-free! In the morning/early afternoon, combine yeast, sugar/agave, and warm water in a small bowl. Cover with a towel to avoid cooling off, set aside for 6-8 min until foamy. In a large bowl, combine flours, salt, and flaxseed. Add foaming yeast mixture. Start combining the ingredients with clean hands until dough forms. Put the dough onto a floured table and knead until soft, about 5 min, adding more white flour if the dough gets sticky. Not sure how to knead properly? Watch some Youtube videos on that. 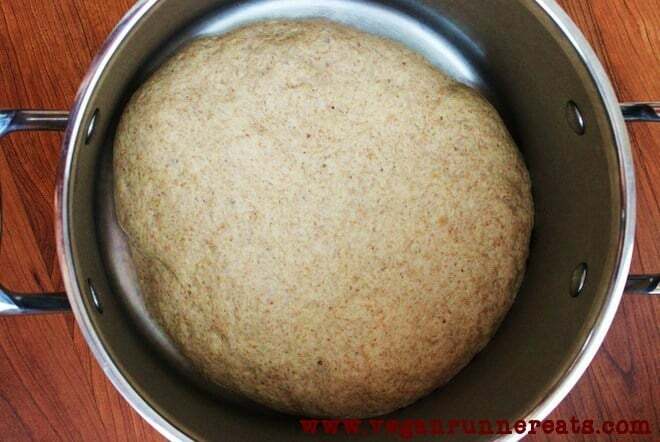 Once the dough is uniformly soft, cover it with olive oil, put into a container with a lid (I used a big soup pot), wrap the container with a towel to create warm environment inside, and leave in a warm place for at least 3-4 hours. Preheat the oven with a pizza stone inside to 450°F. Let the stone sit inside the hot oven for at least 30 min before adding pizza. 10 min before baking your pizza, dust a pizza peel with cornmeal, take the dough out of your container, and spread into a circle (approx. 14 inches) using your hands (not a rolling pin) right on top of the pizza peel. If not assembling the pizza right away, cover the dough with a damp kitchen towel to prevent drying. Lightly grease sliced eggplant and zucchini with olive oil spray. Grill on a preheated grill for about 3-4 min per side, careful not to burn. Take off the grill, let cool slightly, and cut into bite-sized pieces. Chop fresh vegetables of choice into bite-sized pieces. Spread the prepared pizza dough circle with marinara. Arrange a layer of grilled vegetables, then cover with fresh vegetables (except kale and basil). Top with sliced or shredded vegan mozzarella. Sprinkle with oregano. Carefully slide the pizza from the peel onto the hot pizza stone. Bake for 10-12 min, or until the crust looks firm and browned, and the cheese has melted. Note: some vegan cheese brands don't melt well, so watch the crust as an indicator of doneness. Once the pizza is done, take it out and top with fresh basil and kale/spinach. Wait 5 min before cutting. Enjoy! 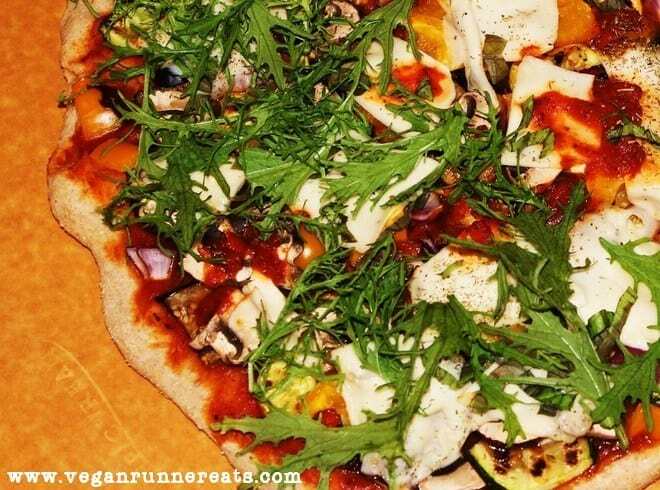 Do you have a favorite vegan pizza recipe? What kind of cheese or pizza toppings do you like to use? Share with us in the comments! Tagged bell peppers, eggplant, homemade dough, kale, vegan dinner, whole food plant based diet. Bookmark the permalink.